Club Oasis at El Capistrano is a beautiful multilevel resort with breathtaking views of the sea and mountains. 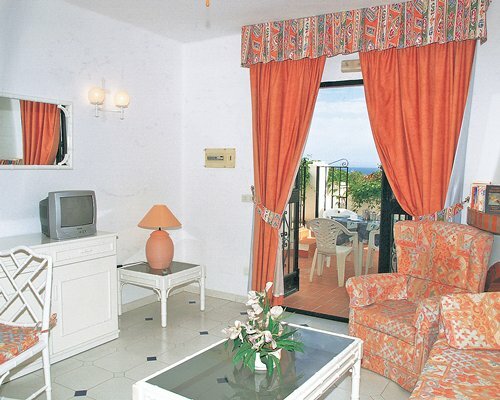 The villas are set on a hillside featuring lovely terraced gardens and water fountains. In addition to the beach, other amenities offered at this resort include two pools (one children's pool), a restaurant, a snack bar, laundry facilities and telephone. Because of the many steps throughout this resort, it may not be suitable for people who have difficulty walking. The one- and two-bedroom villas at Club Oasis at El Capistrano sleep four to six people. All units include full kitchens, dining area, living area with satellite TV, and terrace. Some units include a fireplace. Malaga is part of Spain's sun-drenched Costa del Sol on the Mediterranean Sea. The nearby mountains provide spectacular views and are the setting for many resorts and recreational activities. Watersports available include waterskiing, windsurfing, boating and fishing. Golf, tennis, horseback riding, hiking and biking are all recreation options in this area. There's local shopping, restaurants, bars and live entertainment and a casino a short drive away. Area conveniences include car rental, groceries, hairdresser services and medical facilities. The Malaga Airport is 76 kilometres away.